Sometimes, I have people ask me about pillars. I tell them I’m an old Tennessee boy, and I like the old-fashioned ones with feathers in ‘em. They don’t think I’m near as funny, as I do. But I tell them, “Thank you, thank you. 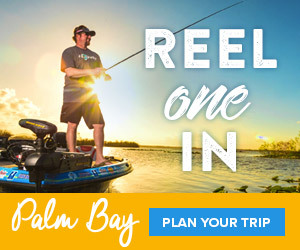 I’ll be hear all week… Well, unless a fishing trip breaks out.” Of course, the latter is ALWAYS the game plan! But seriously, bass fishing bridge pillars is very productive wherever there’s water. Well, boat positioning is important when “pillar fishing.” I fish with the boat headed into the current and cast toward the eddy water on the lee end of the bridge support. Always casting parallel to the piling, I then let the lure drift toward me. If the current isn’t too strong, I’ll fish all the way around the support, fishing it parallel to the long sides and casting across both ends. 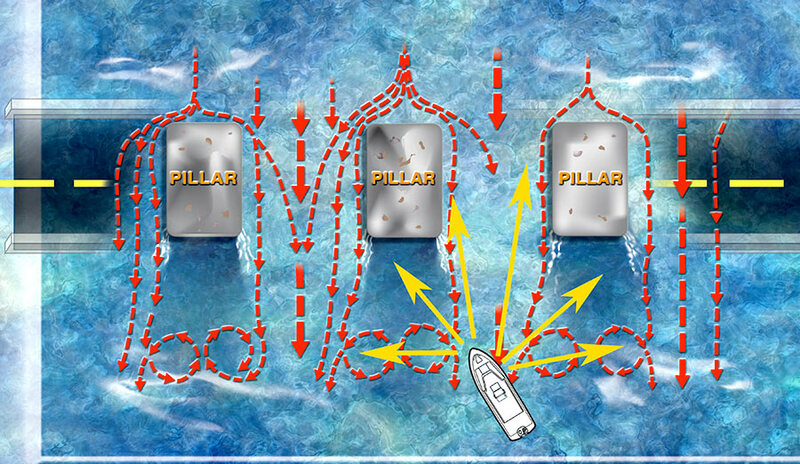 Again, it’s always best to parallel the pillars, pulling or working your lure with the current instead of against it. By fishing in this manner you’ll have better control of your lure and your boat. You’ll also tremendously improve you strike-catch ratio. Bass face the current, therefore, they will see your offering better and can react to it quicker. I seldom find pillar bass in depths other than the 2 to 15-foot range. Sure, they may be suspended over 25-50 feet of water, but they are still most likely to be only 2-15 feet from the surface. About the only time I find them deeper is during the hot summer months when the water temperature is warm and very little current is moving. There are several popular lures for this type of fishing. Topwater lures during late spring, summer or early fall can provide excellent action as well as crankbaits. But some of my favorites would be spoons, grubs and tailspins. * I have found that short bridges can be more productive than longer ones, simply because they seem to have more of that funnel effect that concentrates fish. * End supports closer to shore are usually the best for concentrations of fish, although I always fish around each one. * I normally begin fishing the riprap along the bank and finish up with the riprap on the other end of the bridge — hitting all the columns in between. If the bridge has been productive, it’s smart to turn around and start over again. You can spend the greater part of a day fishing areas of this type. I should also point out that bridge pillars aren’t places where you’ll catch gigantic bass on a regular basis. Over the years, I’ve discovered most of the bass I have caught in such areas run less than 5 pounds. But this certainly isn’t to say that really big ones aren’t taken in such locales at times. Smaller bass stay on the prowl more than the big ones, and as a general rule, this type location does not provide the kind of spots the really big fish select as their territory. One great thing about bridge fishing is that it provides a lot of action. It’s dependable and when the going gets tough at many other places you can head for the bridges and usually score. And yet another thing to keep in mind is that they offer the opportunity for a lot of other species, too. If you’ve never tried this form of fishing you should. Remember bridges are feeding stations and can produce throughout the day.